When you walk into any high end restaurant in Las Vegas, inevitably you’ll be confronted by the laundry list of awards or letters of recognition for that restaurant. However, just like in Hollywood where there are a myriad of awards: The Golden Globes; Peoples Choice Awards; The Academy Awards, there is only one award that actors and directors, et al really covet. The same is true for restaurant chefs, and that award are the Stars from the Michelin Guide. I remember sometimes chefs here, especially the French ones, and even the American ones, we were a bit frustrated that we will never be judged by Michelin. But at the same time we were a little bit, like, more relaxed because obviously the Michelin puts pressure on chefs and restaurateurs to be excellent. The French anticipate the arrival each year of the new Michelin guide the way Americans anticipate the Superbowl. Which chefs gained a star and which have lost a star. Some analysts reckon that the loss of single star can cause a restaurant to lose 25% of its business, on the other hand restaurants can see large gains on the addition of a star, chef Bernard Loiseau saw a 60% gain in business when he first earned his third star. The gain for the chef is more than monetary, the chef’s status changes from mere cook to something akin to an American Rockstar. Loiseau’s fame rose to such a level in France that a poll in L’Hotellerie showed that nearly nine out of ten Frenchmen recognized Loiseau by sight. So one can appreciate the devastating loss it is to a French chef to lose a star.Bernard Loiseau once told a fellow chef that if he ever lost a Michelin star, he would kill himself. An article appeared in Le Figaro in early 2003 stating that Bernard Loiseau was on thin ice with Michelin, and was at risk of losing one or more of his stars. In February 2003 he was told he would keep his three stars in the next guidebook, although he was warned that he was in danger of losing a star in future editions. Another article appeared stating that Loiseau’s third star was living on borrowed time. Two weeks later Bernard Loiseau committed suicide. He had suffered from depression, and had some financial problems, but there were still lingering thoughts that fear of losing a Michelin star in the future may have contributed to his untimely demise. (A more detailed account of Bernard Loiseau’s story can be found in this 2003 article in The New Yorker ) There are other cases of chef suicides connected to Michelin, French chef Alain Zick committed suicide in 1966 after losing a Michelin star. What really separates the Michelin guide from other guides, particularly the popular Zagat guide is the level of training the Michelin inspectors are given. Zagat, of course, doesn’t have professional reviewers, but relies on an army of amateur reviewers. Not only are Michelin reviewers professionally trained, they go to great lengths to remain anonymous to the restaurants they are reviewing. Most city paper restaurant critics fail the test of remaining anonymous. The woman took a seat at one of the tables in the center of the room. She wore a light-blue dress with a high neckline, little makeup, and no jewelry. There was nothing remarkable about her appearance, and her demeanor was quiet and unassuming, as if designed to deflect attention, a trait indispensable for her profession as an inspector for the Michelin hotel and restaurant guide. Inspectors love it when they ask a question and can tell the waiter has made up an answer. You begin to see why a Michelin three star rating is so difficult to garner. 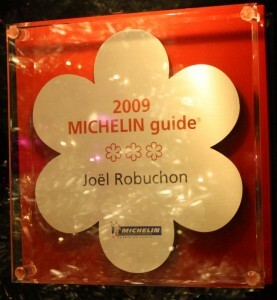 The only Vegas restaurant to achieve a Michelin three star rating is Joel Robuchon’s restaurant at the MGM Grand. In the short few years since Michelin has been rating restaurants in Las Vegas, Bobby Flay’s Mesa Grill has both earned a Michelin star and lost his star. Mesa Grill currently does not have a Michelin star, and he will have to wait at least until 2011 to earn anther star, as Michelin is not updating their 2009 book for 2010.